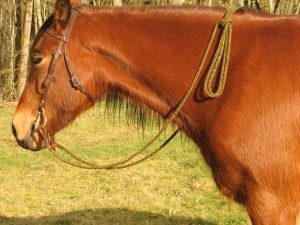 Hand Braided Horse Reins feature a variety of yarns, including alpaca and alpaca blends. We include a strong cotton core throughout the length of the reins and hand shaped loops on each end for leather water ties. Excellent for use in Western Dressage competitions with either snaffle or curb bits. Custom requests accepted. These beautiful one of a kind reins are made in the USA.